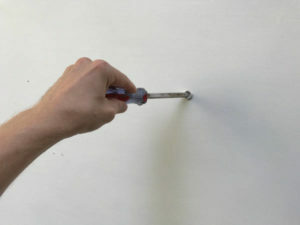 Eventually, everyone will need to find a stud in a finished, painted wall. 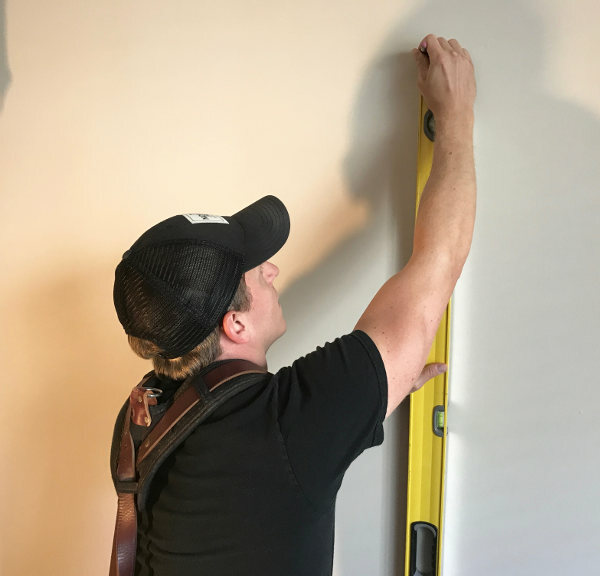 Even with a stud finder, this can be a frustrating task. 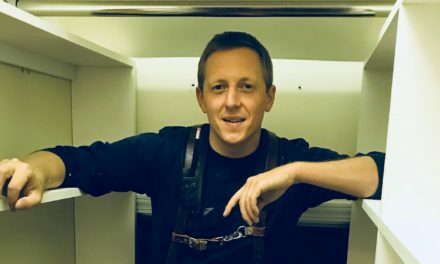 Use these five methods (and one helpful tip) to not only find studs in your home, but also ensure that you’re fastening into them with confidence! 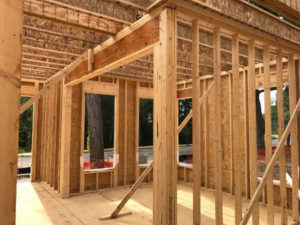 “Knocking” seems to be the preferred method among professional carpenters for finding studs. 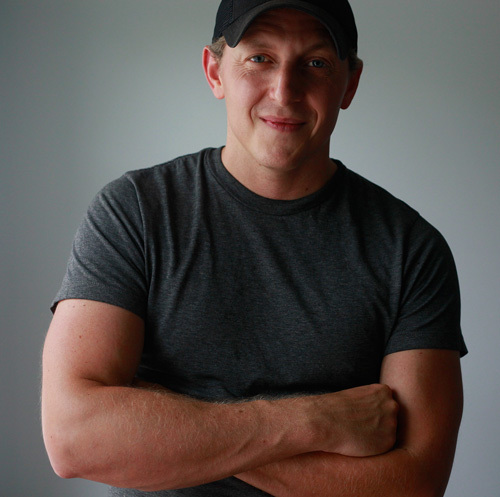 All it requires are ears and hands—tools that you carry with you everywhere you go. Just ball your hand into a fist and rap on the wall with the knuckle of your middle finger, noting the sound that it makes. Now, begin moving sideways slowly, knocking on the wall at intervals of about an inch. The pitch and depth of the sound will change as you travel across the wall. This happens because the wallboard is more rigid where it is fastened to wood. 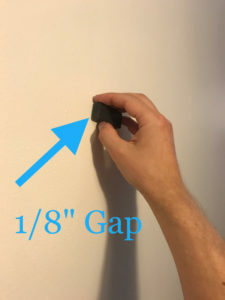 When you arrive at a part of the wall where a stud is standing, the sound will become sharper and more high-pitched. 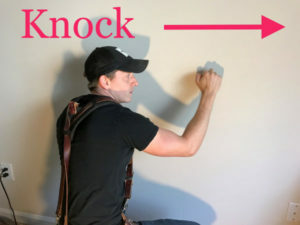 You’ll also be able to feel a greater density in the wall through your knuckles. 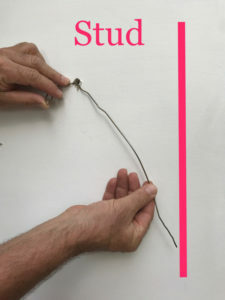 By jumping forward about ten inches from a suspected stud location and working backwards in the same way, you’ll be able to confirm that you’re moving towards the stud from both directions. This method does take some practice. You’ll need to train your ear to pick up the various differences in pitch. Also, you’ll probably wind up with some sore knuckles if you’re not used to thumping on walls. This method works on the same principle as the knocking method, except that it uses vibrations to create sound. The best tool for creating these vibrations? A common electric razor. Just turn the razor on and press it against the wall in question. A loud, chattering, droning sound will instantly fill the room. (It’s pretty annoying, really.) The inner wall is acting as an amplifier for the sound of the razor against the surface. Move the razor sideways along the wall, just as you would in the knocking method. 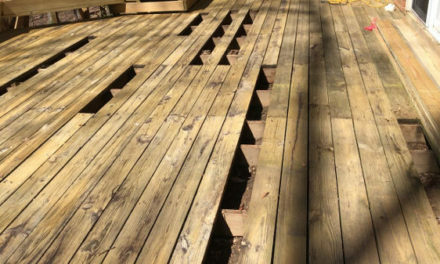 The pitch differences when you go over studs will be drastic. Mark the places where the pitch is highest, and you’ll have your stud locations. 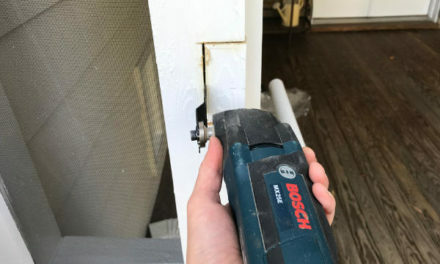 Using a magnet to locate studs is probably the second-most popular method, and the one that I personally prefer. I always keep a variety of magnets attached to the inner walls of my work vehicle just for this purpose. Take a magnet with a strong charge and hold it lightly between your fingers. Now, pass it over the surface of your wall in slow sweeps, using your fingertips to keep it separated from the wall by no more than ⅛”. 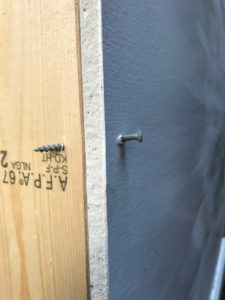 When the magnet passes over a screw head (the place where the drywall is attached to a stud), you’ll feel a noticeable tug. Pass it back and forth over this area a few times, and it will become very obvious exactly where the fastener is located. Mark the spot with a light pencil tick, and you have your stud location. Rare earth magnets are great for this method. They’re small and tend to come in bundles. They have a stronger charge than ceramic magnets, and you can let them snap right onto the wall in a screw location. 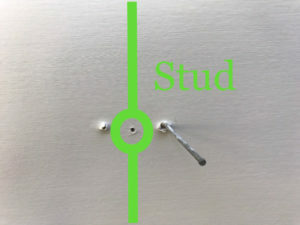 By snapping three or four magnets onto different vertical screw locations, you can visibly lay out the path of the stud. 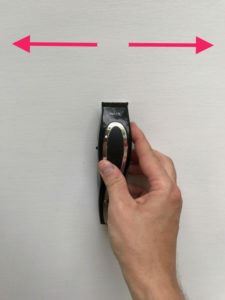 If two or three magnets are in a perfect line, and one is slightly off-center, then you know that one of the fasteners was driven slightly out of place, or at an angle. 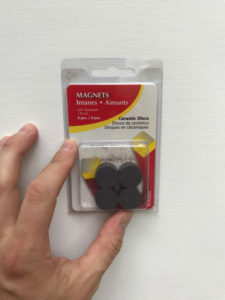 Trust the other magnets for your stud layout. However, where plaster was installed over metal lath (a slightly less common scenario), this method will fail you altogether. 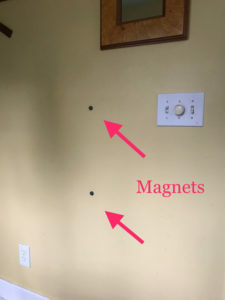 The magnets will detect metal in nearly every square inch of wall space. With the coat hanger trick, you can often locate a stud by making just one dime-sized hole in the wall, which can easily be spackled over and painted. Use a nail set or even a screwdriver to punch a hole that’s big enough to fit your finger through. Next, take a typical wire coat hanger out of the closet. 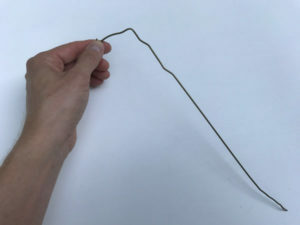 Use needle-nose pliers to unbend it and straighten it out a bit, then put one 75° crook in the wire a foot from the end. Feed the bent end of the coat hanger into the small hole. You’ll have to flex it some to make it clear the 3-1/2” cavity inside. When it’s in up to the crook, though, you can rotate the coat hanger freely, using the hole as a pivot. By rotating the wire in each direction, you will eventually hit a nearby stud. Listen for a light tapping sound within the wall, and feel for resistance. 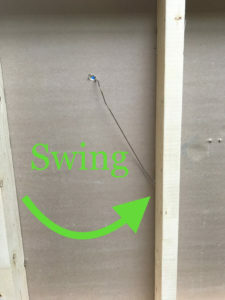 When you think you’ve found the stud, try to pull the wire out at the exact angle at which it was hanging inside the wall. Hold the wire up to the wall at this angle with the crook at the hole. 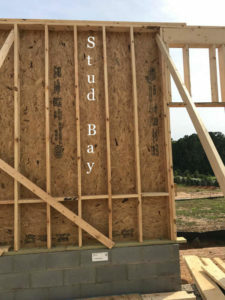 The free end should indicate approximately where the stud is standing. 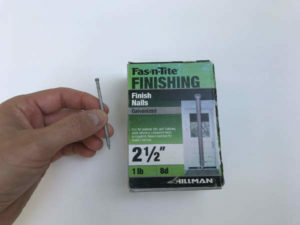 If the nail is over a stud, it will only penetrate about ½” (the thickness of most drywall) and suddenly resist going deeper. 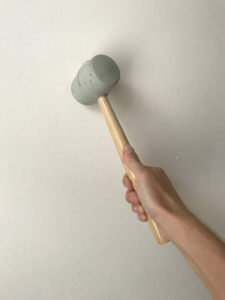 A few more firm taps should only sink it a little, while also producing a dense thumping sound in the wall. Chances are, you’ve located a stud. Don’t bother driving the test nail any deeper—you’ll only make it more difficult to get it back out. IMPORTANT TIP: BRACKET THE STUD! If you’re not hanging or mounting anything too heavy, you can probably get away with putting your fastener straight in at this point. As long you feel resistance while driving it, you know you’re catching wood in the wall—you’re hitting a stud. However, if you’re going to mount something very heavy, like a flat-screen TV, you’ll want to make sure you’re in the center of the stud. 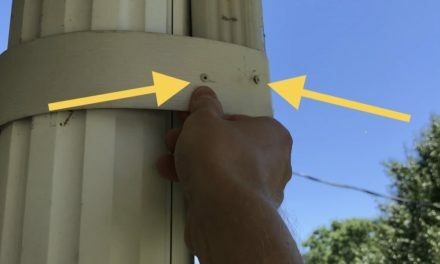 Otherwise, if your fastener only catches the outer edge of the stud (as it did in the picture below), heavy weight could rip it out, and you’ll have a disaster on your hands. All new studs are 1-1/2” thick. Older studs—ones found in houses built before the 1970s—are closer to 2” thick. Either way, the stud center will be ¾” to 1” away from either edge of the stud. So, to find the center of a concealed stud, move over about 1” from the place you originally struck wood, and drive your trim nail again. It should punch through the drywall and sink easily into empty space behind. This is good—it means you’re beyond the edge of the stud on that side. Now jump two inches in the other direction and repeat the process. If the nail sinks into empty space, then you’ll know that your original hole is pretty accurately in the stud center. However, if the nail encounters wood in that direction, it means that your original hole was off-center. You need to pull the nail out and move yet another ½”, or until you find empty space. By using this tip, you can find the outer edges of the stud you want to attach to, and therefore confidently put your fastener straight into the stud’s center, where it will provide the best bearing. If you want to see the other 22 equally helpful methods for finding studs, jump over to Amazon and grab a copy of the ebook. It’s only a few bucks, and it has a lot of additional information about how your house is constructed! 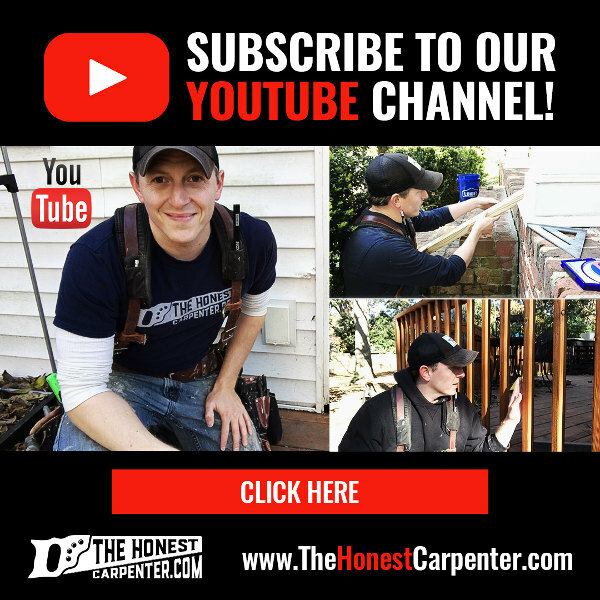 WELCOME TO THE HONEST CARPENTER!